Housetraining is by far one of the most difficult puppy problems that we tackle. It’s also the absolute worst if it doesn’t go as planned. Not even Mother Theresa would have the patience to put up with the constant struggle of pee-stained carpets and the joys of stepping in a fresh poop in the middle of the night. In my experience, this is one of those challenges that’s much easier to tackle in advance BEFORE a problem develops. Once those habits are formed (and I know because I’ve lived it), it can be a lifetime of crates, baby gates, and supervision. If you’re reading this blog groaning inwardly because your dog has already missed the window of opportunity or maybe you’ve adopted an older rescue with housetraining issues it’s not all doom and gloom. There’s a lot you CAN do, but that’s for another blog. This little buoy of a post is reserved for those of you that still have a chance to set yourselves up for an accident-free life with your dog. Step 1: Get a crate. The crate is extremely helpful. It’s not necessarily the only solution but it’s a surefire way to make sure your puppy isn’t getting into anything while you’re doing dishes, in the shower, or getting your kids ready for school. Use the crate for nap time as well. I tell my clients to use it as a place for their puppy to relax, to recharge, and to get that much-needed sleep that puppies are so often deprived of. Pick a couple of hours during the morning and a couple of hours (at least) in the afternoon for your puppy to be asleep in his crate-or sitting quietly with a delicious chew toy. Step 2: Create an area for longer absences. I would love it if you could all tell me that you’ll never leave your dog for longer than he can hold his bladder, but we know that isn’t true. Life happens. It’s really not fair to put your puppy in the crate for so long that he’s forced to urinate in the place he’s sleeping. 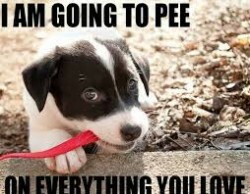 If you need to leave your young pup for longer than two hours in the beginning, put him somewhere that he can pee if he has to, but that is clearly designated for that reason. Most clients use the bathroom (with the toilet paper and shower curtain tucked away), or they might buy an exercise pen. Put his crate in there for him to sleep with a bunch of good chew toys, a pee pad, and some water. Voila! Happy puppy. Step 3: Set your puppy up to do well by limiting his access to the whole house. Puppies prefer carpets for peeing-they’re just so absorbent! If you have any area of the house that is carpeted, close the doors or put up a gate so that your puppy can’t sneak off. If you have area rugs you might want to consider rolling them up and putting them away for a few months. If you don’t want your puppy sneaking up on the bed or your couch (and possibly peeing there), then close the doors and don’t leave your pup alone in those rooms. Basically, if your puppy somehow finds himself alone in an area of the house without you and has an accident, you’ve missed a teaching opportunity! Try your best to keep him in an area where you’ll be likely to see him if he’s looking squirmy so that you can pre-empt an accident.. Step 4: Create schedule and stick to it like glue! Puppies thrive on routine. The more militant you are with the schedule the better off they’ll be. Start with an empty calendar and first fill in your work hours, your walk times, and the times your dog walker might be coming over. Then you can begin to fit the puppy’s schedule in! In general, your puppy will need to go outside after he WAKES UP, after he PLAYS, and after he EATS. So that means if your day starts at 7:30 he’ll have to go straight outside for a potty break, which you’ll reward heavily with treats and praise. When you bring him back in and feed him his breakfast he’s going to have to go straight back out within fifteen minutes. So you’re best to prepare yourself for two potty breaks first thing instead of just one. When you’re SURE your pup has nothing left in his bladder or bowels then he can be free to run around SUPERVISED while you get ready for work (keep him in the room with you). After he’s been playing for an hour or so, he’ll likely need to go out again! So take him out for a potty then it’s probably nap time! This is when most people leave for work, so you can either put him in his crate (if you won’t be gone long or if you’ll be home), or you can put him in the bathroom. Be sure to leave him with lots of food-dispensing toys to entertain and sooth himself (think Kongs or Kong Wobblers etc). If you’re leaving him for a longer stretch like four hours (I’d try not to leave longer than that at first), then you can let him out right when you get back home and then feed him his lunch! Guess who’s going to have to go back out again after he eats??? After his nap time he’ll have to go out for a pee as well, so as soon as you get him up, take him out to his special spot (grass is better), give him a good treat and bring him back in for some lunch. Soon after he eats he’s going to have to go for a pee/poo again so this might be a good time to think about taking him for a little walk. When you come home from the walk he can have an hour or two of supervision, but make sure that if you see him circling and sniffing to quickly take him out and reward him. Don’t forget to make note of when he peed so that you can take him out around that time the following day. Are you starting to get the picture? This type of routine repeats itself throughout the days and weeks as your puppy gets older. You’ll be constantly alternating between naps, potty, eating, potty, walks, potty, and play, potty. It should feel busy, but not stressful…organized chaos if you will. I tell my clients that for each week your puppy has NO accidents you can add another 10-15 minutes or so of supervised play time to his schedule. I’ll say this once and I’d like to say it loudly (I guess that means caps)….DO NOT PUNISH YOUR PUPPY IF HE PEES OR POOPS IN THE HOUSE! Consider it your mistake for not paying attention and quietly clean it up. Before I was a dog trainer I used to yell at my older dog (who is 9 1/12 years old) for peeing. He very quickly learned it wasn’t safe to pee with me in the room, so he started sneaking off to do it. Oh boy. Now not only are you left with a dog that pees inside but he does it where you might not notice it for weeks! Trust me this is not a road you want to go down.